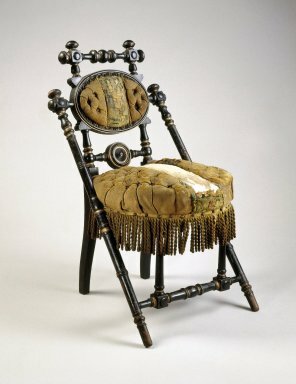 Side Chair, ebonized wood with gilt decoration and original upholstery. Circular seat with faded, tufted green rep and central machine woven floral pattern edged with blue and green cord. Long green fringe secured with hemispherical tacks. Square profile rear legs rise to bulbous turned stiles with gilt highlights; stiles support oval back upholstered en suite with seat. Below back, cross brace with centered flat, circular turned disk; above, turned crest rail. Diagonal turned brace stretches from sides of oval back to become front legs with turned cross stretcher near terminations of front legs. Front stretcher supports two vertical uprights that connect to front underside of seat. CONDITION: Surface original, but very dirty and abraded, particularly at terminals. Seat springs sprung and lower dust cover ripped and seat depressed. Central woven floral panel tattered and missing from top; remnants at front and back seat only. Upholstery very dirty.